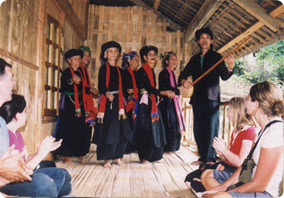 A popular trekking and homestay option starts in Sapa and goes 25 km to the ethnic Tay village of Ban Ho, where stilt house homestays are available. The road hugs the side of the mountain with unobstructed views of the valleys and mountains to the south, with some truly jaw-dropping outlooks onto the stepped rice paddies climbing up the slopes. It can all be done via transport, but many prefer to trek it, and if you go with the right company, they will take you through villages in the valley rather than sticking to the main road. It makes sense to do it this way, because on a motorbike you'd be likely to drive off the edge for being distracted by the sense-tingling views. Walking will take a full day, six to eight hours, each way. If you are going under your own steam, head out of Sapa along Muong Hoau May road and just keep going. There is an entrance gate soon after, where tourists pay the 15,000 VND entrance fee to the area. After about 20 km there is a road down to the right into the valley - you can't miss it because it's the first opportunity where the valley slope is gentle enough to allow for any type of road at all. 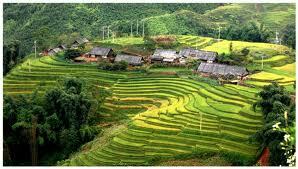 Five km further is the village, and homestays can be arranged on spot for 100,000 VND, plus money for meals. The signature dish here is thit lon hun khoi, better known as smoked ham. You'll find it strung up over the fireplace, and a good piece of meat is smoked for as much as five months, using only dried bamboo as fuel to get the best flavour. It's usually served sliced with rice and hot sauce. There are some hot springs here that are a good way to relax your sore muscles after the trek. As you enter Ban Ho village, you'll cross a bridge over a small stream. The first right, before the village gate, head up the hill, and from there you can pick your way along alleys towards the river (Suoi Nong). If you're on your own, you'll have to ask for directions. The last bit has to be done on foot, but you'lll eventually find a bamboo bridge across the river, and on the other side are three tiled, cement pools containing hot spring water pumped from underground. On our visit, the water was only tepid, but the owner assured us that the colder the weather, the hotter the spring water. The Vietnamese, of course, bath wearing as much clothing as possible, but if you hop in in your birthday suit, no one will arrest you -- just be prepared to get giggled at. A dip costs 10,000 VND, and you'll want to show up during daylight hours, because crossing that bamboo bridge in the dark would seem extremely unwise.